Maximum fully extended strap length: 60"
Satchels have adorned the sides of mankind from early times to the modern age. While what we carry may change, how we carry it, in a satchel, has stayed true to tradition. We have found the extracted wisdom of those ages in the hands of our craftsmen and women who make these bags using techniques that stand the test of time. All that history and style is incorporated in a versatile way that meets the demands of the modern day by making an easily accessible and secure place for your laptop, cords, and tablets. 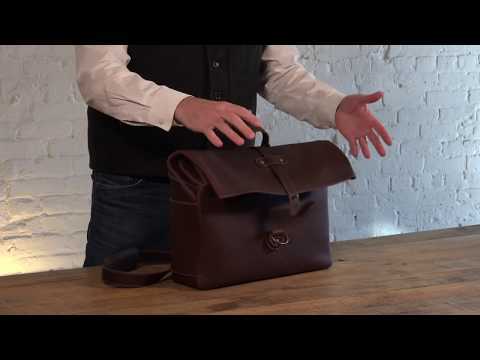 This bag is made of a rich full-grain leather that only looks better as you handle it over time. That timeless perfection starts early in our selection process where only the best hides are chosen. We then get them to our tannery where they are tanned, dyed, and waxed into rich deep colors like Galloper Black, Chestnut, and Whiskey. The patina that these develop with use is truly gorgeous and entirely unique to you and your travels. After the leather shows up at our workshop, the real magic starts. We eschew the automated assembly line in favor of our expert craftsman and women. Only their knowing hands are trustworthy to cut the leather into the panels for assemblage. As the bag comes together, the artisan discreetly attaches his name to the inside of the bag in a proud display of workmanship. The most gorgeous and perfect leather in the world is nothing without the stitching that binds it together. That's why a seemingly unimportant detail, like stitching quality, is not overlooked in our designs. We use a UV-resistant nylon stitching that is the same as used in parachute construction. If they can count on that shoot to open and stay intact sky high, we know we have found the right stuff to hold our bags together for decades. Leather is naturally water-resistant, but we took things one step further with the rolltop design of this. We know how important keeping your tech out of the weather can be. Slip in that laptop and its other electronic buddies and roll or fold the satchel top down, snap over the rivet closure and you are road ready. Our extremely durable brass hardware on these leather bags are nearly unbreakable. They can withstand the wear and tear of every day carry while showing almost no wear or tear at all. We don't cheap out on hardware. Only the best for our bags. We back up every bag with 25-year leather warranty and a 30-day money-back promise. You will love the feel of this bag in your hands, that is our Pad & Quill promise. Welcome to the family!